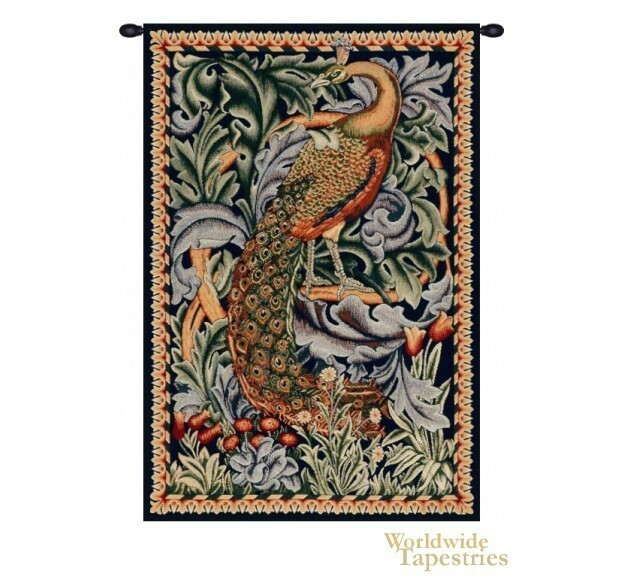 In its original form, “The Peacock” was part of a much larger tapestry, “The Forest”. It is still considered one of William Morris’ most successful works. Designed in 1887 under commission by his patron, Alexander Ionides, “The Forest” contained a lion and crow as well as the peacock. The Peacock’s detail is impressive at all levels, as is the design itself. “The Peacock” was the work of architect Philip Webb while the acanthus leaves used in the background were contributed by Morris’ eventual successor, Henry Dearle (1860-1932). The tapestry is a testament not only to their friendship, but their artful collaboration. The Forest tapestry is on display at the Victoria & Albert Museum in London. This reproduction shows the beauty of the original design which shows Morris' love of nature and his ability to portray nature's beauty in his unique style. “The Peacock” is lined and has a tunnel for easy hanging. Note: Tapestry rod and tassels, where pictured, are not included in the price. Dimensions: W 29" x H 39"